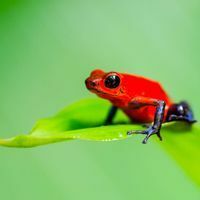 Human development may destroy natural habitats, but it could also provide amphibians with a safe haven from deadly fungal infections. Extinct Monteverde golden toadIMAGE: WIKIMEDIA COMMONS, US FISH AND WILDLIFE SERVICEAmphibians that inhabit natural environments are more likely to be infected with the fatal Bd fungus that has devastated frog and salamander populations worldwide than those living in habitats disturbed by human development. The results, published yesterday (May 30) in the Proceedings of the National Academy of Sciences, challenge the assumption that habitat loss necessarily exacerbates the spread of disease. "I don't think anyone will be going up in the mountains cutting down trees in the hopes of getting rid of Bd or anything," said Forrest Brem who researches amphibian epidemiology at the University of Memphis and was not involved in the research. "But I think this study will remind everyone how complex host-pathogen-environment systems are and encourage us to incorporate this complexity in their thinking, teaching, and research." Bd (Batrachochytrium dendrobatidis) is a member of the chytrid fungus family, which attacks some 350 amphibian species. In the last 15 years, it has caused massive declines of amphibian populations around the world, even driving some species to extinction. The fungus, spread by skin-to-skin contact or through the water, kills by causing the outer layer of skin to thicken and become less permeable to the water-borne electrolytes amphibians absorb to keep their hearts beating. And for those amphibians that absorb oxygen through their skin, a Bd infection suffocates them. 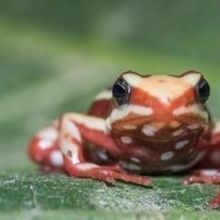 Since the international trade of amphibians as food, pets, and lab animals took off in the 1970s, Bd has passed to every continent that supports amphibian species. 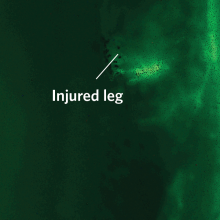 "It's spreading like a wave," said C. Guilherme Becker, a graduate student in ecology and evolutionary biology at Cornell University and lead author on the study. "Especially in Central America and Australia." In addition to the spread of Bd, amphibians across the globe are suffering from loss of habitat caused by human development. The combination of the disease and habitat loss is a "double threat," said Becker, and implementing successful future conservation efforts requires an understanding of interactions between these two forces. To this end, he and his advisor, Kelly Zamudio, compared habitat loss and Bd infection data from tropical sites in Costa Rica (for the common rain frog) and in eastern Australia (for the Stony Creek frog). In contrast to past studies of other human and animal diseases, they found that the frogs in disturbed habitats were less likely to be infected. Field surveys of disturbed and natural habitats of the golden lesser tree frog in the Brazilian Atlantic Forest confirmed these findings. Despite many studies showing that habitat disturbance increases disease in human and animal populations, in the case of Bd "it is not surprising that disease risk is higher in more natural habitats," Ross Alford, professor of tropical ecology at James Cook University in Australia who did not participate in the research, said in an email to The Scientist. Bd is very intolerant of the hot, dry environments that often result from habitat disturbance, he explained. Furthermore, natural environments support a greater number of hosts that could help spread the fungus, added Becker. The three species studied, however, are habitat generalists that are relatively tolerant to human disturbance. But other species are not so hardy, and will either suffer from the changing habitat itself, or retreat to natural habitats, where Bd is more prevalent. "Disturbed habitats may act as shelters from disease, but only for the very few species that can tolerate deforestation," Becker and Zamudio wrote in their paper. "This study contributes to our understanding of the interactions [of Bd with amphibians] and may well aid in thinking 'outside the box' in developing management tools," said Alford. C.G. Becker and K.R. Zamudio, "Tropical amphibian populations experience higher disease risk in natural habitats," PNAS, doi: 10.1073/pnas.1014497108, 2011.